Gavrilo Princip (1894-1918) was born in June or July 1894, the son of a postman. One of nine children, six of whom died in infancy, Princip's health was poor from an early age: his eventual death was caused by tuberculosis. After attending schools in Sarajevo and Tuzla, Princip left for Belgrade in May 1912. While in Serbia Princip joined the secret Black Hand society, a nationalist movement favouring a union between Bosnia-Herzegovina and Serbia. Princip was one of three men sent by Dragutin Dimitrijevic, the chief of the Intelligence Department in the Serbian Army and head of the Black Hand, to assassinate Archduke Franz Ferdinand, the heir to the Austro-Hungarian throne, during his visit to Sarajevo on 28 June 1914. Ferdinand had accepted the invitation of General Oskar Potiorek to inspect army manoeuvres in his capacity of Inspector General of the army. The other men sent to assassinate Ferdinand were Nedjelko Cabrinovic, and Trifko Grabez. The three men were instructed to commit suicide after killing the Archduke. To this end they were each given a phial of cyanide, along with a revolver and grenades. Each of the men suffered from tuberculosis and consequently knew that they did not have long to live; meanwhile, Dimitrijevic did not wish any of the men to live to tell who was behind the assassination. The prime minister of Serbia was given advance warning of the assassination plot, and whilst a sympathiser of the Black Hand's objectives - Bosnia-Herzegovina achieving independence from Austro-Hungary - he feared war with Austria-Hungary should an assassination attempt be successful. He therefore gave orders for the arrest of the three men as they left the country; his orders were not acted upon however. Once in Bosnia-Herzegovina the three men met up with six fellow conspirators and travelled onwards to Sarajevo. Franz Ferdinand arrived in Sarajevo on 28 June 1914, a Sunday, and was met at the railway station by General Potiorek, to be taken on to the city hall for the reception and speeches. Seven members of the Black Hand lined the route due to be taken by the Archduke's cavalcade along Appel Quay. One of the men, Nedjelko Cabrinovic, threw a grenade at the Archduke's car. The driver took evasive action and quickly sped from the scene. The grenade bounced off the back of the Archduke's car and rolled underneath the next car, exploding seconds later; two of its occupants were severely wounded. Cabrinovic swallowed his cyanide capsule as instructed, and jumped into the River Miljacka. He did not die however, but was captured and arrested. It is speculated that the capsule contained nothing other than a harmless water-based solution. Ferdinand attended the reception at the city hall and complained vociferously about his reception at the city. "What is the good of your speeches? I come to Sarajevo on a visit, and I get bombs thrown at me. It is outrageous!" Archduke Franz Ferdinand interrupting the Mayor's welcome speech at Sarajevo's city hall, 28 June 1914. Following the reception the Archduke determined to visit those injured in the grenade explosion at the city hospital. General Potiorek decided that the motorcade should take an alternate route to the hospital, avoiding the city centre altogether. However the driver of Ferdinand's car, Franz Urban, was not informed of the change of plan and so took the original route. Turning into Franz Joseph Street, General Potiorek, who was a passenger in Ferdinand's car, noticed that the altered route had not been taken. He remonstrated with the driver who in turn slowed the car and then began to reverse out of the street. Gavrilo Princip, who happened to be in Franz Joseph Street at a cafe, seized his opportunity, and took aim at Ferdinand from a distance of five feet. His bullets struck the Archduke in the neck and his wife, Sophie, who was travelling with him, in the abdomen. Urban drove the car to the governor's residence at Konak; the couple died soon afterwards. 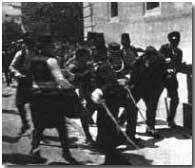 After the shooting Princip made to turn his gun upon himself but was seized and restrained by a man nearby, aided by several policemen. He was arrested and taken to a police station. In total eight men were charged with treason and Franz Ferdinand's murder. However under Austro-Hungarian law capital punishment could not be applied to anyone under the age of 20 when the crime was committed. Gavrilo Princip, whose precise date of birth could not be firmly established at his trial, was therefore imprisoned for the maximum duration, twenty years. He died however of tuberculosis on 28 April 1918. A "dogfight" signified air combat at close quarters.